When you make a trip to Myanmar, it will be certainly a regret if you miss the opportunity to enjoy delicious San cuisine of San people. The San cuisine is so good and appetizing with its own distinctive characters that can not be found anywhere in the world. The San is an ethnic group of Myanmar, living mainly in San State and adjacent areas of the borders between Myanmar and Thailand and China. In contrast with using a lot of cooking oil and fish sauce as common Myanmar people’s cooking habit, San people use soy sauce to process food. They like to use a lot of vegetables which can be chosen to cook or eat raw. If you travel to the San’s residential areas, you will realize that every San household has a garden with different vegetables, and in the San’s meals never lack the dishes made from vegetables. The San in Myanmar use a lot of vegetables in their meals. In the San’s residential areas, there are not a lot of rivers and springs that aquatic products are so scarce. Shrimps and crabs there are very small with little meat. Fish, if yes, are only freshwater fish and very tasty, often mixed with spices, wrapped in banana leaves and baked on hot coal. Pork, chicken and beef and even buffalo meat are the main Shan dishes. In addition, on the occasions of village fair, they can trade in goods and foods such as venison, pheasant meat and some other wild sources of food to supplement their own tray of rice. Some foods such as ant-eggs, cicadae, frogs and winged insect larvae can be made into very delicious and rare dishes which are only eaten in certain seasons by local people. An indispensable dish in the San cuisine is dried fermented soybeans called hto nao. The fermented dried beans are usually made into thin plates and used to enhance the flavor of soups as well as other types of dishes such as noodles. The San also grind the dried soybeans to dust and then mix it with tomato, chili, pepper, onion, garlic and coriander to become a hot spicy mixture served with salad. This mixture is a typical spice of the San. Retaining the beauty of yesteryear, the San still use banana leaves to wrap food, especially in baked dishes, which creates a distinctive flavor for these dishes. Traditional rice of San people include sticky rice and main dishes such as meat, fish served with vegetables, soup and the indispensable spicy hot spice which is made from dried fermented soybean. If you are in the Myanmar travel and want to enjoy the San’s delicious dishes, you can visit Lashiolay Restaurant chain (in Mandalay and Yagon), which is the typical restaurant chain serving the San’s dishes. In addition, there are several famous restaurants such as View Point Restaurant in the village of Nayang Shwe, the gateway of Lake Inle. When visiting these restaurants, you are able to enjoy the most characteristic San dishes made by San cooks themselves. You can enjoy some of the dishes below. Shan Rice: Shan rice is a rice dish that combines rice cooked with turmeric and a piece of fresh water fish marinated with garlic. This is a favorite dish of people who love spicy dishes and the characteristic taste of turmeric in some Southeast Asian countries. San noodles: This type of noodles is very delicious, and visitors who once enjoy it will definitely love it. A perfect bowl of Shan noodles is the combination between thin fibers of rice noodles and the broth of chicken or pork, adorned with roasted sesame seeds and garlic flavor, served with pickled vegetables that it’s so delicious. Shan noodles with tofu: This dish is quite special, which is made from yellow lentils and green beans instead of fermented soybeans as usual. Slices of tofu are usually served with yellow noodles, eating hot with soup or cold with salad. Making Burma tours, you are fascinated by not only its stunning scenery but also unique experiences of the San cuisine. 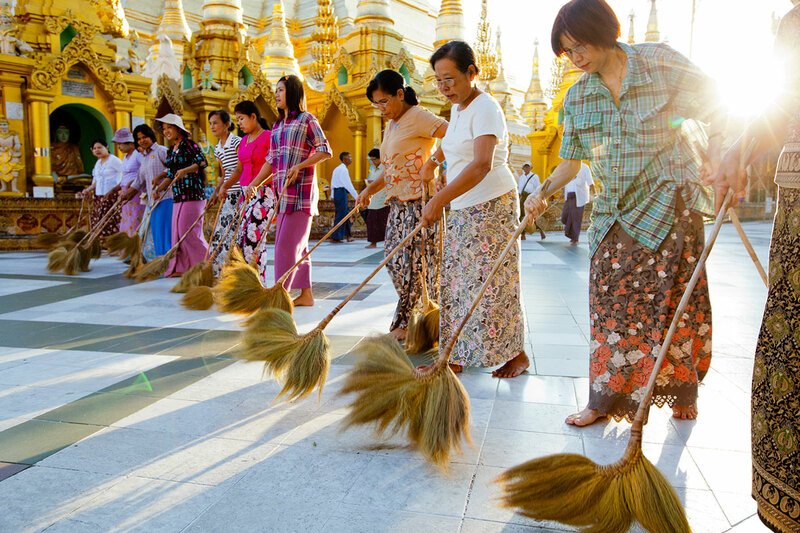 Do not hesitate to intend immediately the tours to Burma to have your own experiences.